We’re making changes to further improve ZenHub’s reliability! To ensure the best experience for our users, we’ll be performing some maintenance on Saturday, April 20th between 1-5 PM Pacific Time (UTC-8). During this time you may experience disruptions to your ZenHub workspace loading. We apologize for an inconvenience this may cause. Thanks for your patience and please don’t hesitate to reach out to support@zenhub.com with any questions. We shipped a small button that holds great power. Close all of your connected Milestones from the Burndown chart in one click! Remember: with great power comes great responsibility. Make sure the Milestone is complete - to reopen connected Milestones, they must be opened individually through GitHub. We've fixed dozens of minor UI bugs and introduced new markdown features by implementing a new library 🌟. 🆕 Emoji support, color blocks, and more! Writing out emojis, such as :shipit:, render the emoji's image in Issues. 3 or 6 digit hexadecimal color codes show color previews next to the code block. Use a code blocks #5e60ba to render in-line color previews. Using <!-- --> displays hidden text in Issues. This is helpful when creating Issue templates to provide instructions on best practices for using the template! To make tables easier to scan, there's now alternating row colors. Use the <details> markdown option to create sections that can expand and collapse to show/hide information. Using #issue references in code blocks will no longer create Issue references, but remain as content in a code block. Using @ symbols inside code blocks will no longer mention users, but remain as content in a code block. Links with brackets [ ] ( ) will no longer break mid-link. When @ mentioning there's not extra spaces after the username. HTML for image upload and styling is supported. If images have custom width/height coded in the image URL they will no longer break. Ordered list items now indent properly, including showing sub-nested ordered and unordered lists. On Saturday, March 23rd 2019 between 1:00 and 5:00 PM Pacific Time (UTC-8) we will be performing infrastructure maintenance. You can continue to use ZenHub during this time, but might experience disconnect errors. You might experience a Board cannot be loaded or Error loading Workspace error intermittently as you navigate. A few refreshes should resolve this during the maintenance window! Any changes made during the maintenance window to your Workspaces, reports, or GitHub Issues will be saved. If you have questions when returning back to work after Saturday, don't hesitate to get in touch! Issue titles and comments properly word-wrap on the Board and in the Issue page. File uploads will now properly copy and paste for users on Chrome 73. If there is a deleted repo in a multi-repo Board, the Cumulative flow and Control chart will no longer hang during loading. 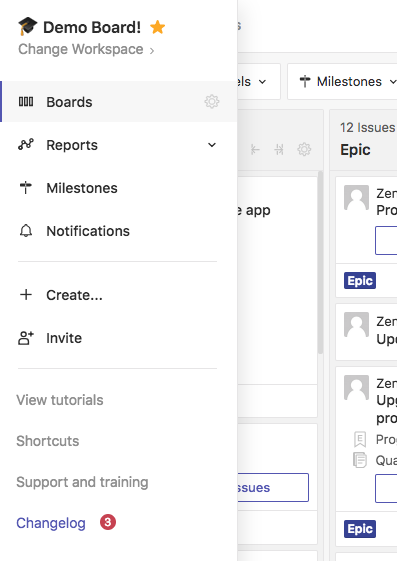 Creating Issues/Epics in GitHub with the extension will no longer show a duplicate Create an Epic button at the bottom of the sidebar. When creating a Milestone in ZenHub the mouse focus area now goes to the title, not the start date. Repo names no longer appears as undefined on hover in the web app Milestone page for multi-repo Workspaces. Loading the Board is also now faster! We no longer render an Issue card's option menu—these will only be loaded when clicked . 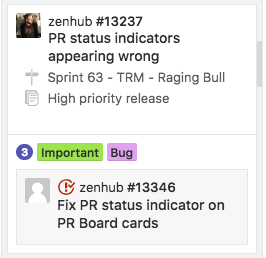 The status of a PR will now show open/merged/closed properly on PR cards in the Board. Previously, if a PR was merged, it was appearing open, and when open, it was appearing as closed/merged. Milestones When loading the Milestone page in the web app, teams with many open Milestones will no longer hit the limit of only 100 loading. The limit is now 1200. Control chart Averages on the Control chart now round to a single decimal point (instead of showing 10). Issue titles will wrap, not truncate. Header text (i.e Average days to close) has more contrast to make it easier to read. When hovering over the Average time to completion line on the Control chart, the tool tip no longer displays "Average days to Closed". Instead, it properly displays the completed pipeline that you've set. Confidently plan and track your projects by forecasting when work will be completed using Control charts. 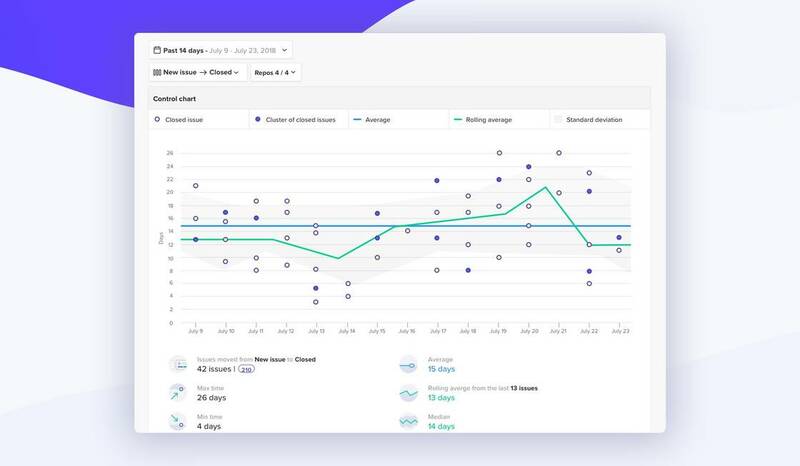 You can forecast how quickly work will be completed by measuring throughput, uncover blockers, and identify bottlenecks. Review the help guide to learn how-to read the Control chart and best use cycle and lead time in your projects. Sign up for a Kanban workshop, where a product specialist will review your charts and offer insights and recommendations to improve how you use ZenHub and ship software. We've shipped an in-app changelog 🌟! In the web app you'll be notified with a red badge of new fixes, new features, and enhancements. In the extension the sidebar Changelog link leads here—the badge won't appear, so periodically check-back for what's new. Curious what else is upcoming? View our roadmap here. In our improved Issue modal in the extension we broke copy/paste (sorry!). This is now fixed—using ⌘+C and ⌘+v properly copies text 🔨. Surely ZenHub will start publishing changelogs very soon.